The round top window and cage-like front porch of the Bates mansion make it instantly recognizable—even when it's sitting on a rooftop in the middle of Manhattan. 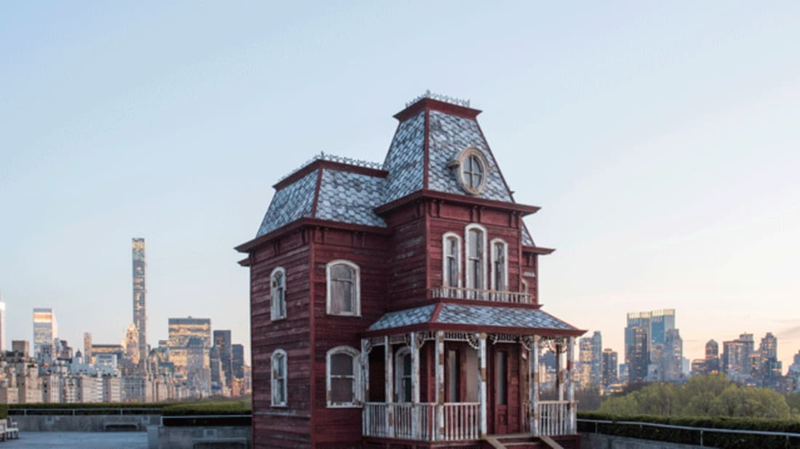 As reported by Fast Co. Design, a sculpture resembling the house from Psycho (1960) is now on display in the Metropolitan Museum of Art's Iris and B. Gerald Cantor Roof Garden. The 30-foot tall architectural folly, dubbed the PsychoBarn, is the creation of British Artist Cornelia Parker. After she was commissioned by the Met to build an exhibit for the top of the building, she initially envisioned a barn. That turned out to be a little overly-ambitious, so she came up with something smaller and significantly creepier. Viewers may not see a barn when they look at Parker's final product, but she was still able to find a way to stay true to her original vision. The wooden posts, red siding, and corrugated steel roof were all salvaged from an old barn in upstate New York. The house consists of two facades propped up with scaffolding, giving the structure the illusion of a completed house. Before drawing inspiration from Alfred Hitchcock's classic suspense thriller, Cornelia Parker made a name for herself with her imaginative, large-scale art installations. Her previous works include a room filled with the charred remnants of a forest fire and a reconstruction of an army shed being blown apart. Visitors to the Met in New York City can view her latest exhibit from now until Halloween. Images courtesy of the Metropolitan Museum of Art.